There has been some controversy over the status and name of this hosta type. Schmid (1991) determined that it should be given cultivar and not species status. Thus the name H. 'Lancifolia'. The Hostapedia by Mark Zilis (2009) argues that it is, in fact, a species and should therefore be known as Hosta lancifolia...However, in his Field Guide to Hostas (2014), Zilis agrees (mostly) with the Schmid format. Hosta Helper will use the format suggested by Schmid. Historically called the "Narrow-leaved Plantainlily", H. 'Lancifolia' Is one of the most widely grown of all the hostas. It was originally introduced into the United States from China in the late 1800's. It forms a medium size (16 inches high by 36 inches wide) mound of lance shaped, smooth textured foliage with thin substance. The flowers are medium lavender and bloom on numerous scapes from mid-August into September. According to The Hostapedia by Mark Zilis (2009), "...has many desirable characteristics, including a fast growth rate, a symmetrical mound habit, decent foliage, and a good late-season show of flowers. For those very reasons, however, it has been vastly overused during the last one-hundred years. 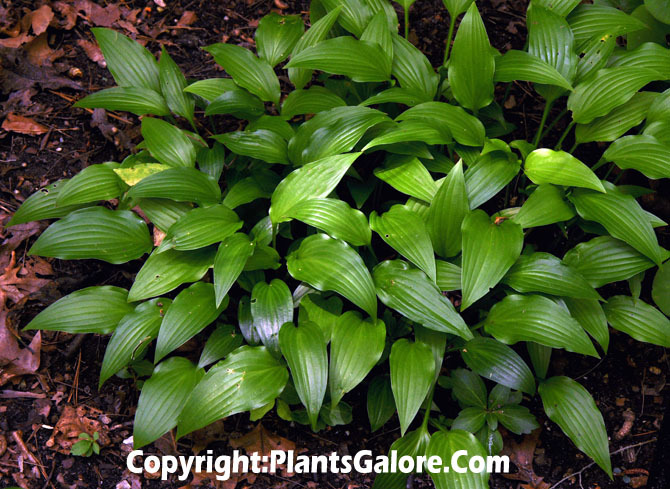 There are now thousands of hostas with better substance, more exciting foliage, and better flowers so most hosta collectors ignore this workhorse of the shade garden." This plant has been awarded the Royal Horticultural Society's Award of Garden Merit in the UK. It may have been sold in the past as Mackwoods No. 16. The New Encyclopedia of Hostas by Diana Grenfell (2009) states: "...often confused with H. cathayana and H. sieboldii... Emerges early, so the leaves may be damaged by spring frost. Vigorous and floriferous. Has been used for mass planting in both public and private gardens since its introduction to the United States in the 1800s." An article by Frederick McGourty, owner of Hillside Gardens in Connecticut in The Hosta Journal (1985 Vol. 16) states that, "I suspect that a few of the older hostas will survive the onslaught. One that I see everywhere these days, from planting of other times, is Hosta lancifolia, which makes a serviceable edging or ground cover, although the glossy green leaves are small for the genus. It is still one of the best hostas for flowers, which are rich lavender and borne in the latter part of the summer after most other hostas have ceased blooming. Hosta lancifolia is almost indestructible, a trait not always appreciated by nurserymen. Like marigolds, it has suffered a lot from banal uses." Nomenclature changes recommended in the 1991 book The Genus Hosta by W. George Schmid and accepted by The American Hosta Society would update names as follows: H. 'Lancifolia' . In an article in The Hosta Journal (2001 Vol. 32 No. 1), Tom Micheletti, former President of The American Hosta Society took on the task of listing the "Classic Hosta Cultivars" through the year 2003. He decided to divide these into categories including: Green, Blue, Yellow (Gold, White-Margined, Yellow-Margined, White Medio-Variegated and Yellow Medio-Variegated. Of course all species of hosta are green, and they are all classics. Those that are readily available to gardeners are: H. longipes , H. kikutii, H. montana, H. plantaginea, H. ventricosa, H. venusta and H. yingeri . H. 'Candy Hearts' has dark-green heart-shaped leaves. H. 'Donahue Piecrust' is one of the best piecrust-margined hostas. H. 'Fortunei Hyacinthina' is the precursor to many sports. H. 'Green Fountain' has long pointed flowing leaves. H. 'Joseph', if you want shiny dark-green leaves, this the plant for you. It has masses of lavender flowers to boot! H. 'Hirao Majesty', H. 'Hirao Splendor' and H. 'Hirao Supreme' are each distinctive. H. 'Honeybells' is one of the first fragrant hybrid hostas. H. 'Invincible' is not indestructible, but very distinctive with shiny dark-green leaves and large fragrant flowers. H. 'Lakeside Black Satin' is noted for every dark-green satiny leaves. H. 'Lancifolia' is probably the most widely grown hosta. H. 'Leather Sheen' has dark-green leathery leaves. H. 'Maraschino Cherry' is another dark-green, but just wait till the flowers appear in late summer on dark, cherry red petioles! H. 'Elatior' is the one, if you like big hostas. There are a couple of look-alikes, but this one's flowers grow straight up rather than sideway from the plant. H. 'Pearl Lake' is an old time blue green that has staying power. H. 'Regal Rhubarb' is one of the first hybrids to have red petioles. H. 'Royal Standard' -- who can fault this plain green, sun-tolerant hosta in late summer when masses of pure white fragrant flowers appear? H. 'Second Wind' is a plain green sport of a popular variegated plant, but distinctive and showy in its own right. H. 'Sparkling Burgundy' is another green with delightful flowers and red stems. H. 'Tortifrons' is like no other hosta! H. 'Undulata Erromena' is the green sport of the white-margined hosta that Grandma grew. This is quite an extensive list of distinctive cultivars. Many have been popular either with gardeners, landscapers and collectors for over 25 years...Their timeless beauty is why they are still kicking after all these years. In 1991, the then most comprehensive book about hostas, The Genus Hosta by W. George Schmid, was published. It was the first intensively researched book about the entire genus which, until that time, suffered from a lot of misinformation and name confusion. As the result of his research, Schmid determined that several of the plants previously treated as separate, naturally occurring, species were, in fact, cultivated varieties, i.e. cultivars, created by nurseries and hybridizers or of unidentified origin . This hosta is one which was historically considered a natural species but was changed to a cultivar by Schmid. For more on this process.. .